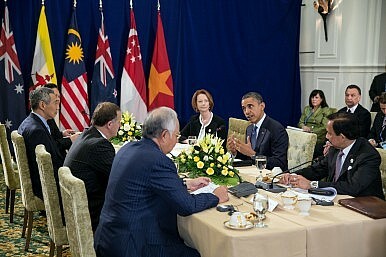 U.S. President Barack Obama and Malaysian Prime Minister Najib Razak participate in a 2012 TPP meeting. Support deemed sufficient for country to get mammoth free trade pact through. Malaysia is almost certain to pass the Trans-Pacific Partnership (TPP) agreement domestically in spite of the obstacles currently faced by its current prime minister, a scholar told a Washington, D.C.-based think tank Tuesday. Although Malaysia is one of 12 countries in the mammoth free trade pact, which comprises 40 percent of global GDP, some remain concerned as to whether the current government under Prime Minister Najib Razak – now embroiled in a high-profile corruption scandal – will be able to push the deal through at home once negotiations are concluded in the following months (See: “After the Scandal: What’s Next for Malaysia”). While Najib himself has supported the TPP as a way to boost Malaysia’s economy, the agreement is unpopular among some, including conservative Malays who oppose the cuts in state enterprises and government programs that benefit them. As I reported in June, a Pew Research poll found that Malaysians showed the least support for the TPP among all participants, with just 38% being for it (See: “Do Asians Back the US Pivot More than Americans?”). But Pek Koon Heng, a professor at American University and a Malaysia expert, told an audience at the Woodrow Wilson Center for International Scholars today that the TPP would almost certainly pass in Malaysia in spite of the opposition to the agreement itself and Najib’s government more generally. “I’m quite certain he will get it through,” she said in response to a question from The Diplomat. For one, Heng said that with Najib’s recent sacking of several ministers – including his powerful Deputy Prime Minister Muhyiddin Yassin who is known to be more skeptical about international trade deals – Malaysia’s premier has consolidated control over his cabinet. “He now has a compliant cabinet,” Heng said. Even if the TPP faces such fierce opposition that it has to go through Malaysia’s parliament before being approved, Heng said Najib would have enough votes to get it through. “He’s got sufficient votes,” she said. As for the concern that Najib may be removed from office altogether, Heng said that despite fierce protests by the opposition and civil society – protests last week drew an estimated 100,000 people – Najib is in no real danger of losing his position and is likely to remain as leader of his party, the United Malays Nationalist Organization (UMNO). Looking further out, she said she expected the ruling coalition, the National Front (BN), to secure a win in the 2018 elections, retaining its position as the world’s longest continuously serving coalition. “He will lead the government coalition to another victory,” she said. Najib’s survival, Heng said, would not only be good for the TPP, but arguably the U.S.-Malaysia relationship more generally. She noted that U.S.-Malaysia relations under Najib’s tenure were “stronger than they have ever been,” with the two sides upgrading ties to the level of a comprehensive partnership in 2014. No other leader in Malaysia today, Heng said, would demonstrate as much support for the United States. Heng added that Washington, for its part, had done its fair share to advance relations with a willing partner. As The Diplomat reported last month, the Obama administration had controversially upgraded Malaysia in its annual trafficking report this year, removing a potential obstacle to its inclusion in the TPP (See: US Upgrades Malaysia in Trafficking Report: Boost for TPP, Blow to Rights?). “And for that, Najib is very grateful,” she said. More broadly, Heng also noted that the administration has for the most part been muted in its criticism of Najib’s government on democracy and human rights. She said Washington had adopted a softer line in speaking out against Malaysia’s domestic crackdown on the opposition relative to the past, with public rebukes largely restricted to the country’s treatment of refugees and migrants. “The only area that the U.S. continues to push Malaysia is refugees and migrants,” she said. US Upgrades Malaysia in Trafficking Report: Boost for TPP, Blow to Rights? Washington argues that Malaysia has made significant efforts to improve its record. Interview: Malaysia’s Political Turmoil and the Role of the United StatesUS Lawsuit Against Malaysia's 1MDB: Who Is 'Official 1'?US, Malaysia to Set Up New Center to Counter Islamic State by End of 2015Malaysia Files Criminal Charges Against Goldman Sachs for 1MDB ScandalWhat Does Mahathir’s Return Mean for Malaysia’s Foreign Policy?